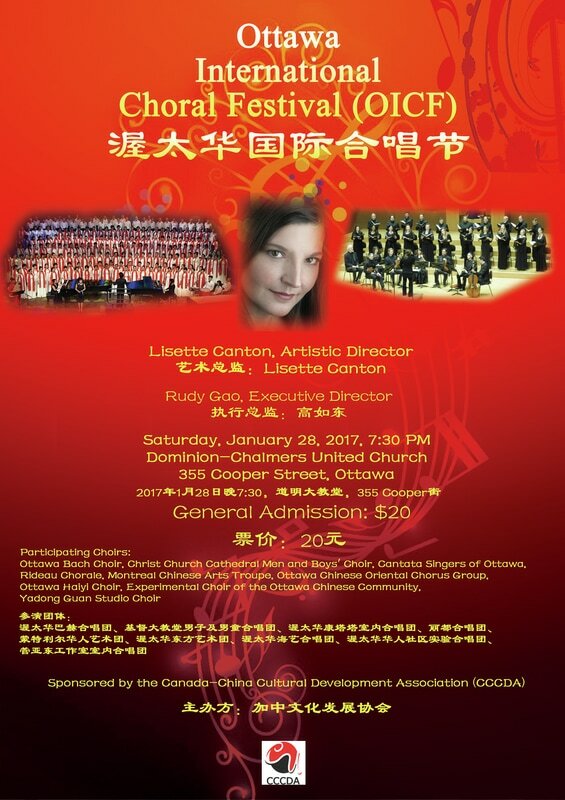 Ottawa (Canada) - The Canada-China Cultural Development Association has the honour of launching the first Ottawa International Choral Festival (OICF), on Saturday, January 28, 2017. This new OICF festival will showcase all things choral, including a massed choir on Parliament Hill and an inaugural concert! There will be participation from choirs from Ottawa, including the Ottawa Bach Choir, the Christ Church Cathedral Choir of Men and Boys, the Rideau Chorale, the Cantata Singers of Ottawa and the Ewashko Singers, as well as those with a Chinese choral emphasis from Canada, the United States, and China. Because of the invaluable significance of promoting choral arts with respect to contributing to multicultural prosperity in Canada, and realizing the unlimited potential of communication, cooperation and exchange amongst various choral groups and communities with different heritage backgrounds and performing styles, this festival was born. To launch the festival, all participating choirs will showcase a concert on January 28, 2017 at 7:30 PM, at Dominion-Chalmers United Church. Part of the festival's mandate will give one of the international classical choirs the chance to be considered for the next China International Chorus Festival in Beijing, China.